Masala Papad is the most famous Indian side accompaniment recipe to serve with Cocktails and Mocktails. 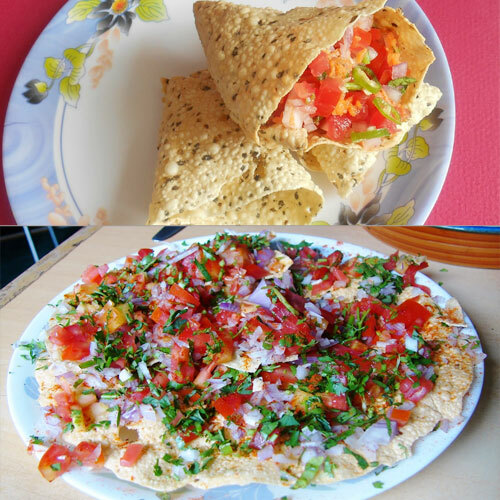 Simply fried papad is topped with the salad of onion, tomato and spices. It is a best snack or side dish to serve in any occasion or get together. Urad dal papads 4, Onion finely chopped 1 medium, Tomato finely chopped 1 medium, Green capsicum finely chopped 1 small, Fresh coriander leaves finely chopped 4 tablespoons, Red chilli powder 1/2 teaspoon, Salt to taste, Chaat masala 1 teaspoon, Lemon juice 1 teaspoon. Roast urad dal papads on low flame or in a Microwave. Mix together finely chopped onion, tomato, capsicum, half of the fresh coriander leaves, red chilli powder and salt to taste. Place one papad on a serving plate. Spread some onion- tomato mixture over it. Similarly prepare the other papads. Sprinkle chaat masala and lemon juice. Sprinkle the remaining coriander leaves on top and serve immediately. It can be served to 4 people.